Do you have a penchant for adrenaline rushes? If the answer is in the affirmative, then you would do well to check out the Waterskiing Chair. The name itself is somewhat an oxymoron – have you ever seen anyone go water skiing sitting down in a relaxed position? Well, this patented chair will be mounted to a pair of waterskis, where it paves the way for both beginners and experts to ski from a stable seated position. The idea isn’t new as it was introduced nearly half a century ago (! 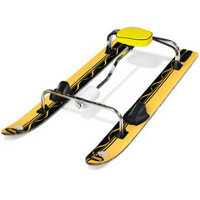 ), where the chair comprises of a backless seat that is connected to broad, widely-spaced skis by a pivoting steering mechanism. If you happen to lean to one side in the chair, it will automatically cause the skis to carve the water in the same direction. Sounds like the perfect tool to get started without getting too wet in the process! The asking price could prove to be a stumbling block though at $799.95 each, so make sure you have the missus’ approval before you sign that cheque!